This guide will walk you through the process of sending flight performance (Revenue and Load Factor) using the Secure File Transfer Protocol (SFTP). 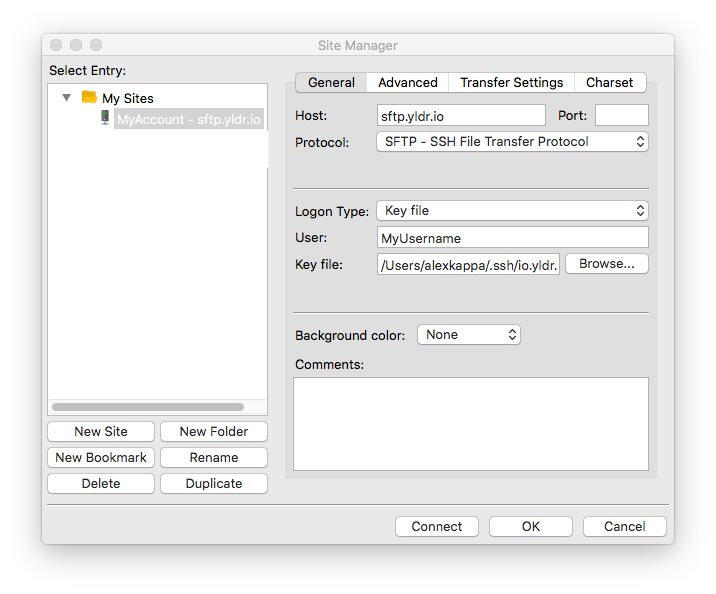 You will need your SFTP username and private key at hand. If you don't have SFTP enabled for your account, contact support@yieldr.com and ask to have your account configured. 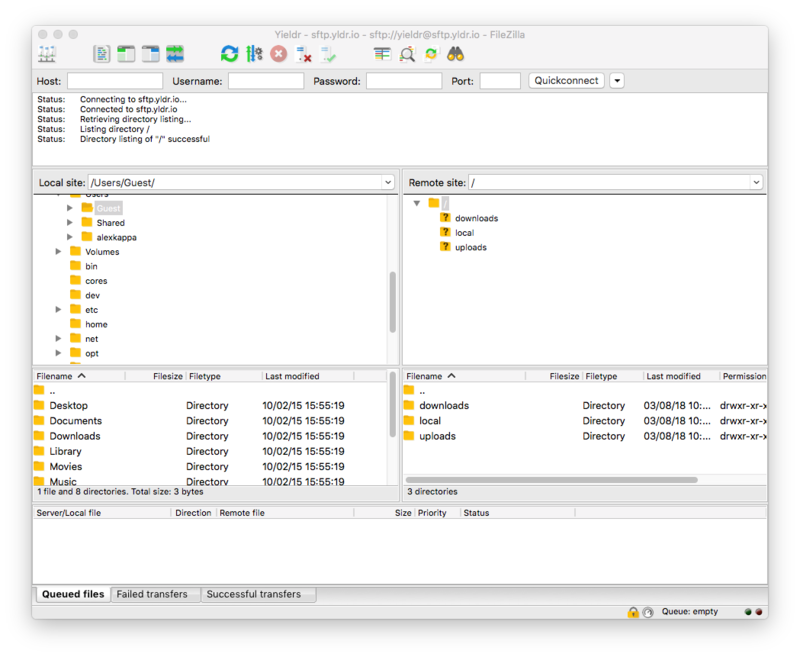 There are a number of ways you can connect to your accounts SFTP server. 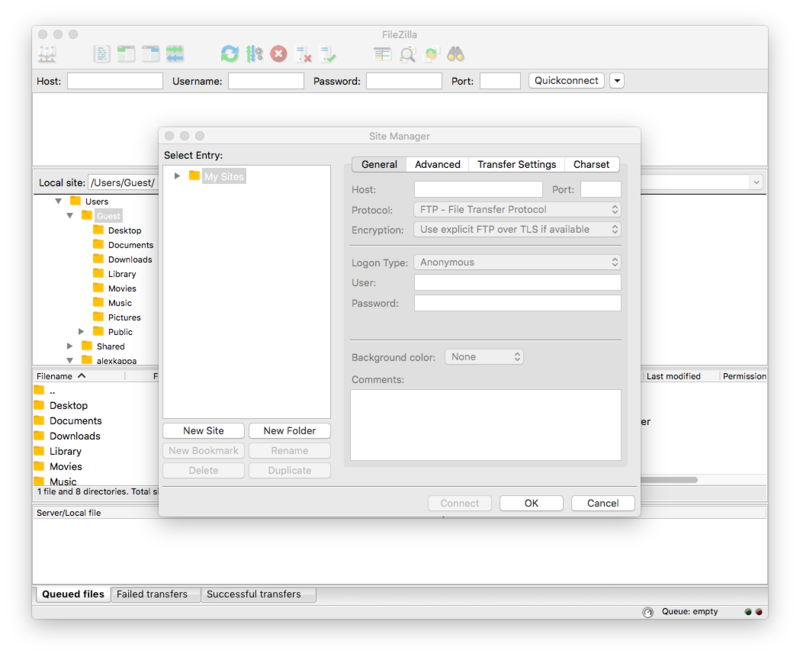 We will be using FileZilla - a popular open source FTP client - but you could use any other software and it should work similarly. On the top left of the application's main window, click the Site Manager button. Select New Site and enter a name for it. Once connected, three directories are listed: downloads, local and uploads. When uploading files, you should use the uploads directory. The downloads directory makes it possible for us to send you files. Regardless of the method you choose to connect, you must ensure the file is formatted correctly, and use the correct directory structure. We support the comma-separated values (CSV) format and compressed using GZIP. Refer to this guide for more details on how to format the columns in the CSV file. The following table details the flight data structure and all the available fields. For daily files, follow the naming convention YYYY/MM/DD/<IATA-CODE>.gz. For example 2018/12/28/YD.gz for a snapshot of YD on the 28th of December 2018. For historical files, follow the naming convention YYYY/MM/<IATA-CODE>.gz. For example 2018/12/YD.gz for a snapshot of YD in all of December 2018. When uploading multiple days in a single file, format your CSV file with an additional column observation_date in the format YYYY-MM-DD to specify for which date this observation is made. Daily snapshots don't need this as the file naming implies the date of observation. For continued ingestion of your flights data we recommend uploading a snapshot at least once a day using the Daily Files mentioned above. This can be done using the Task Scheduler for Windows users or Cron for UNIX/Linux users. Now you should be well on your way to tracking flight performance with Yieldr!